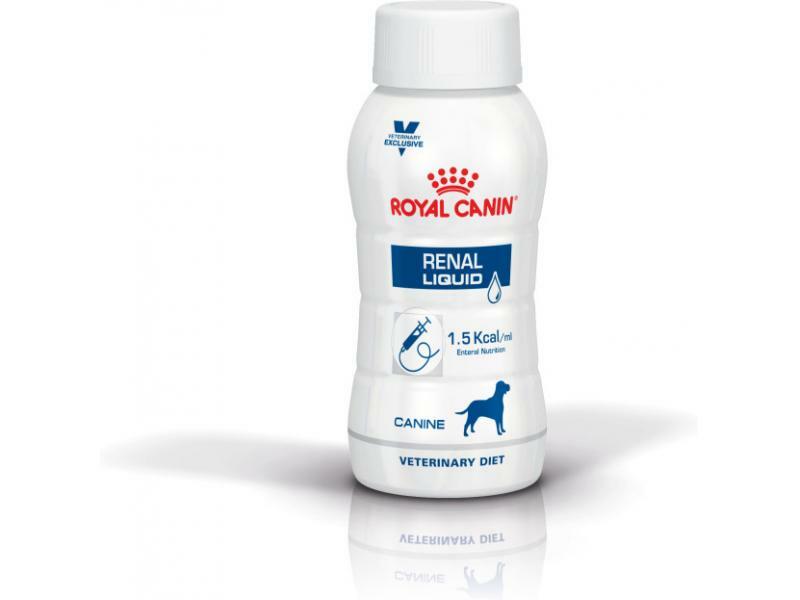 Royal Canin Renal is a nutritional support diet for dogs suffering from renal insufficiency and failure. The food contains reduced phosphorous levels for the benefit of dogs with chronic renal failure that are unable to break down phosphorous in the body. With green tea polyphenols to neutralise free radicals and encourage renal perfusion, helping to promote the health and function of internal systems, as well as long-chain omega 3 fatty acids to improve the condition of skin and coat, for a healthier looking dog. A digestible and palatable recipe to suit even the fussiest canine appetites. RENAL is a complete dietetic feed for dogs formulated to support renal function in the case of chronic or temporary renal insufficiency, through its low level of phosphorus and high quality protein. Reduces renal workload - Increased kidney workload may induce uremic crisis. An adapted content of high quality protein helps reduce kidney workload. Appetite preference - Designed aromatic profile helps answer to dog’s specific preference. Ckd dietary management - Formulated to support renal function in case of chronic kidney disease. Contains EPA and DHA, a complex of antioxidants and a low phosphorus level. Metabolic equilibrium - Chronic kidney disease can lead to metabolic acidosis. Formulated with alkalinizing agents. COMPOSITION: rice, maize flour, animal fats, maize gluten, maize, hydrolysed animal proteins, beet pulp, wheat gluten*, minerals, fish oil, vegetable fibres, soya oil, fructo-oligo-saccharides, psyllium husks and seeds, marigold extract (source of lutein). ADDITIVES (per kg): Nutritional additives: Vitamin A: 15800 IU, Vitamin D3: 1000 IU, E1 (Iron): 40 mg, E2 (Iodine): 4 mg, E4 (Copper): 12 mg, E5 (Manganese): 52 mg, E6 (Zinc): 154 mg, E8 (Selenium): 0.05 mg - Technological additives: Clinoptilolite of sedimentary origin: 5 g - Preservatives - Antioxidants. ANALYTICAL CONSTITUENTS: Protein: 14% - Fat content: 18% - Crude ash: 3.9% - Crude fiber: 2.4%- Calcium: 0.4% - Phosphorus: 0.2% - Potassium: 0.6% - Sodium: 0.35% - Essential Fatty acids: 4.08% - EPA and DHA: 0.47% - Urine alkalinising substances: Potassium citrate - Calcium carbonate. Low Phosphorus - A low phosphorus intake is key to help support renal function in dogs with chronic renal insufficiency. Composition - Meat and animal derivatives (pork, poultry), cereals, oils and fats, eggs and egg derivatives, minerals, derivatives of vegetable origin, yeasts, various sugars. Additives (per kg) - Nutritional additives: Vitamin D3: 285 IU, E1 (Iron): 11 mg, E2 (Iodine): 0.5 mg, E4 (Copper): 2.7 mg, E5 (Manganese): 3.3 mg, E6 (Zinc): 33 mg.
Analytical constituents - Protein: 7% - Fat content: 9.2% - Crude ash: 2% - Crude fibres: 0.5% - Moisture: 63% - Calcium: 0.25% - Phosphorus: 0.1% - Potassium: 0.35% - Sodium: 0.07% - Essential fatty acids: 3.6% including EPA/DHA: 0.5%. Formulated to support renal function in case of renal insufficiency: high quality proteins and restricted levels of phosphorus. Contains EPA+DHA and antioxidants. Complete and balance liquid diet to support the renal function in case of renal insufficiency, for dogs requiring assisted enternal nutrition. Milk and milk derivatives, cereals, oils and fats, minerals, derivatives of vegetable origin. Source of protein: low-lactose milk, caseinate. Crude ash: 0.96%. Crude fibre: 0%. Crude oil fats: 5.32%. Moisture: 100%. Protein: 3.32%. Vitamin A: 6700 IU, Vitamin D3: 220IU, E1 (Iron): 40mg, E2 (Iodine): 1mg, E4 (Copper): 4mg, E5 (Manganese): 3mg, E6 (Zinc): 63mg, E8 (Selenium): 0.2mg. 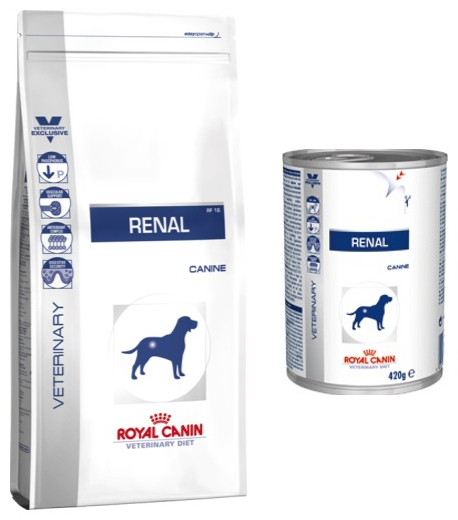 Below are some recent questions we've received regarding Royal Canin Canine Veterinary (Clinical) Diets Renal Dog Food, including answers from our team. My dog is not too keen on the renal wet food, he's a fussy eater and I have to try and disguise the meat with something else is it ok to do this? As he likes boiled chicken and sweet potato I've mixed a small amount with his meat. The difference between the RF 16 and the R4 13 is the Royal Canin Renal Special diet (RF13) has been created with a specially formulated aromatic profile to provide a different taste, aroma and texture to the standard Renal diet. The benefits to kidney health and reducing their workload will be quite similar. Rosy weighs 30-35kg what amount of mix food should she have daily. I have been advised 1+1/2 wet and 1 cup dry daily. This seems a lot, and she has put on weight. Is it okay to reduce her to 1 tin wet 1 cup dry daily please?. With a few dry as treats. The correct amount to feed is actually the amount of food which produces the correct body weight. This you can only discover by trial and error, and adjusting the amount as indicted in time by her weight. It would be perfectly safe and sensible to try the amount you feel is right, then see how she does. Weigh her periodically and see how she compares with what you feel would be her ideal weight (your vet or vet nurse can help with this).